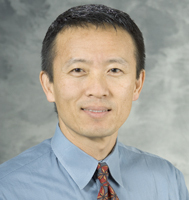 Dr. Kim is an associate professor of pediatrics and medicine at the University of Wisconsin School of Medicine and Public Health. He is fellowship-trained in pediatric emergency medicine, meaning he has received training specific to the needs of children from birth to 18 years who are brought to the emergency room. As the director of pediatric emergency medicine program at the American Family Children's Hospital, his main goal is to promote pediatric emergency preparedness throughout the county, region, and state. He serves as the co-chair for the Wisconsin Emergency Medical Services for Children (EMSC) and emergency medicine section of Wisconsin American Academy of Pediatrics (AAP) chapter. He also serves as a member of the Wisconsin EMS advisory board. As a physician leader in acute pain management in pediatric emergency care, Dr. Kim has contributed in changing the culture of pain management for children with acute abdominal pain with a seminal publication in 2002. Since then, he has contributed many journal publications to improve acute pain management in the emergency department setting for children. For his most recent project, he is one of three investigators in a second cycle of three-year, EMSC-funded project to develop a novel educational method for prehospital providers to improve pain management in the field for children.